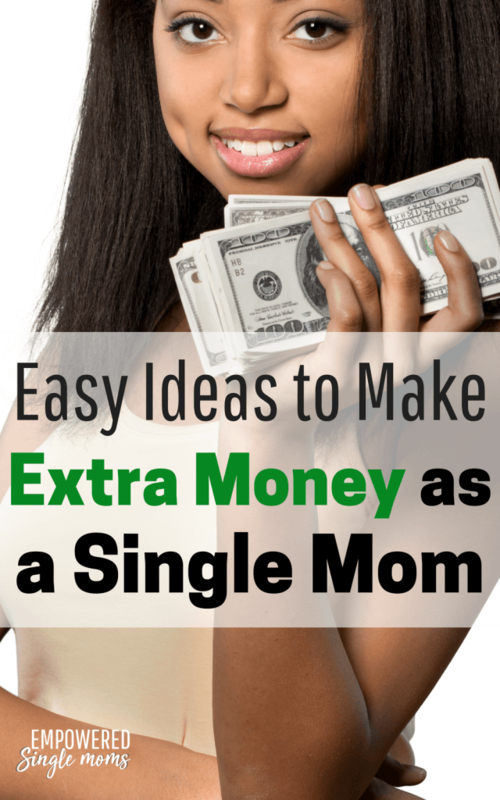 Most single moms are looking for ideas to make extra money. We have mouths to feed and it is up to us to buy the food. When I first got married, money was even tighter than when I was first divorced. I remember many times rummaging through the fridge and cupboards to see what we could make because it was a few days before we would have money for groceries. We never went hungry, but we often made do with what we had. Having a budget and living frugally is important, but pinching pennies only goes so far. I was at a craft fair a couple of days ago and it inspired me. I was amazed at all the different ideas to make extra money. For some vendors, craft fairs are a side hustle and for others, selling crafts provides a significant portion of their income. 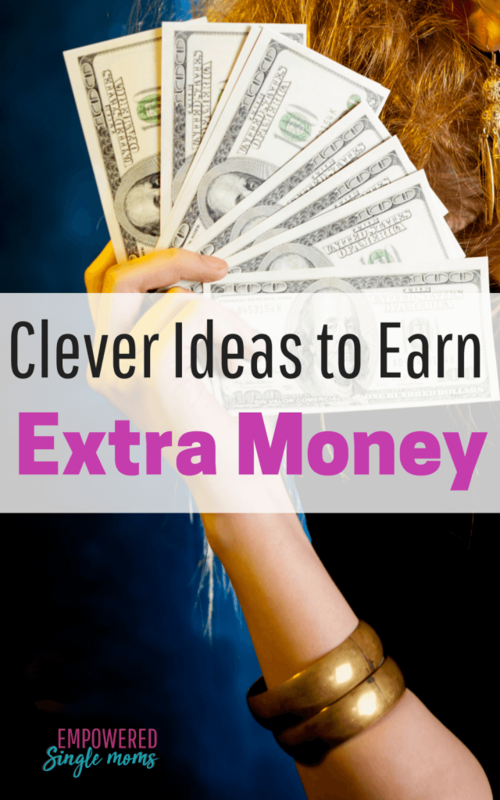 I wondered how many ideas I could find to earn extra money. We are a participant in affiliate programs including the Amazon Services LLC Associates Program, an affiliate advertising program designed to provide a means for us to earn fees by linking to Amazon.com and affiliated sites. Read the full disclosure policy here. You can sell these things at art and craft fairs or online in an Etsy store. I saw at least three people selling mittens made from old sweaters. Some were rather basic. Others were embellished with fur, buttons, or even embroidery. You can get directions on how to make mittens here. The mittens in the local high school’s colors and logo were particularly popular. These mittens were priced between $30 and $45 per pair, and most of the sweaters had been purchased at thrift stores or garage sales. There were several people selling soap. Unusual scents seemed to be a popular choice, especially for people buying soap as a gift or holiday stocking stuffer. I’ve seen old chairs that have been turned into amazing works of art. Why stop at chairs? My office desk and credenza are actually an inexpensive roll-top desk and old buffet that were repainted. They have gotten many compliments from office visitors and they cost a fraction of what new furniture would have. I put together a board on Pinterest to inspire you. I have bought several perfectly useable chairs for $3–$5.00 at rummage sales. Several of them were sturdy enough to survive three years in a house of college-aged men. There is a shop in town that sells stenciled signs. I have a hand-lettered sign over my kitchen sink that I ordered from Etsy . Here is a tutorial if you want to try sign painting. At the craft fair, I picked up lovely solid lotion made with a variety of oils and beeswax. It is supposed to be great for a number of skin conditions. Here is a recipe if you want to try it. There were a couple of vendors selling homemade bread for $5.00 or $6.00 a loaf. I noticed this summer there were also several people selling bread at the farmers market. If you have a knack for baking, selling bread may be an excellent way for you to bring in some extra cash. Be sure to look up your local cottage laws before preparing food to sell. If you paint, do woodworking, draw, or create pottery, sell it! Walk around an art or craft fair and think about how you could put your own twist on the ideas that you see. I have a friend who designs creative T-shirts, which she sells on Zazzle and Amazon Merch. I think I might try this idea for fun. She tells us how to do it in How to Maximize Earnings in a Zazzle Design Store. If your kids have toys or clothes they have outgrown, you can declutter and make some extra money at the same time. There are a variety of ways to do this including garage sales, Craig’s List, local Facebook selling groups, and consignment stores. We used to have one in town that would pay you for things when you brought them into the store, which is the option I prefer. There is a free section on Craigslist.org. You can get items for free and resell them at rummage sales or relist it on Craigslist. It may require some fixing or painting, but if you’re savvy you could make some money. If you decide to try painting furniture, this might be a great place to look. I was amazed last week when I heard the story of this company. I’ve met these folks! In 2003, the founder started buying items and reselling them. She used a closet as her inventory area, and then the spare bedroom, and then the garage. Now, the company has 10 full-time employees and a huge warehouse. They have an unbelievable but true story. There are a lot of things that people will pay you to help them with. The best part is that, as a mom, you probably already have the skills! The following ideas are short-term solutions if you need to make some quick cash. They are not great long-term solutions because time is already precious and working two jobs is not sustainable as a long-term option for most moms. This is something you can trade for money or services that you need–like your childcare for your own kids or maybe snow removal or yard work. Evenings and weekends are prime times for people looking for childcare when they have an irregular schedule. This is something you and the older kids can do together: mowing lawns, raking leaves, and planting flowers. It requires minimal tools that you probably already own or can borrow from the homeowner. Nursing homes are always looking for help. If you have time when the kids are with their dad, trade time for money. There are also special needs kids, adults with disabilities, or elderly people who would not be able to stay in their homes without the help of a personal care attendant. Duties vary depending on the client. Sometimes you just need to provide company to give the regular caretaker a respite or take people who can no longer drive to appointments. Other times, you are helping with showering and other more personal needs. Pet sitting is often a low time commitment. If you would like a pet but don’t have the resources right now, this is a great way to have a part-time pet and make extra money. We did this when my husband was in graduate school. It was easy money. We lived in a really nice house instead of our married student housing and earned extra money. Sometimes dog walking was included in the duties other times they just wanted their ritzy house to look lived-in while they were gone. These make great second jobs because the need is highest on nights and weekends when the kids may be spending time with their dad. If you work a regular 9 to 5:00 job, this might be a good short-term option and you will come home at the end of your with some cash in your pocket. Warning: if you are successful in starting a business you will most likely make more money than you can make working for someone else. The downside is that this is a long game, not a short-term solution. You need the skills to work in the business and do what needs to be done and you need business skills to work on the business. Are you using your skills to build someone else’s business, but you could be building your own business? Depending on your situation, you may be able to do some part-time work on the side along with your full-time job. Being a hairstylist, accountant, bookkeeper, real estate agent (become a broker), massage therapist, esthetician, financial planner, baker, plumber, electrician, contractor, HVAC technician, editor, writer, virtual assistant, or computer programmer are just a few skills that you can use to start your own business. What are you doing now that you could turn into a business? In my case, I went from working in an agency to private practice. Read the story of what I did when I was out of work . Warning: Multi-level marketing is not for everyone. You will do best if you find a product you are passionate about, have a wide social network, and like to sell. If you were the kid who just couldn’t ask your extended family to buy all those things kids sell for fundraisers, this may not be for you, but network marketing was the answer for this accidental network marketer. Several people make a fantastic living that started with a blog. Warning: Blogging is not a get-rich-quick scheme. I will write more about this in the future, but for inspiration, read Sarah Titus’ story about how she went from homeless to 57k per month. Our local brewery and winery were each started by people who brewed wine or beer as a hobby before it became their full-time business. Several of the ideas under using your creativity could start as a side gig or hobby and become a full-time business. You could get a roommate or occasionally rent out a room through Airbnb. I have friends who built a yurt and rent it out through Airbnb. Another single mom I know built a tiny cabin with the help of friends and rents it by the week in the summer. Do you have an RV, boat, fish house, four-wheeler, or even a canoe or kayak? While you are at work or doing something else, why not rent them out and let them earn their keep. Ebates is one of my favorite ways to make a few extra dollars. You can earn rebates when you buy things you would get anyway or when you refer friends. Learn more about Ebates here. Warning: Only buy on credit what you can pay off when the bill comes. That said, if you have large purchases like furniture or home repairs, check around for credit cards that offer you a cash bonus or points. Trade those points for something you want like motel rooms or airfare. There are also store cards that offer a refund, like the Target Red Card which gives me 5% back on every purchase. I also have an airline card that lets me take a bag for free and gives me double miles when I use it to buy my airline tickets. I’ve noticed that often when you buy a $100 in gift cards, you will often get an extra $20 gift card. This seems to be most common at Christmas time, so watch for specials during the holidays. It is most common at restaurants, but I have seen it even at the grocery store–and who couldn’t use $20 in free groceries? There are several money-saving apps you can use to save a few dollars here and there. Every dollar counts. Try Ibotta you can earn cash back by using Ibota with this referral link, you get a $10 credit to start. My favorite is the Target app, which is like getting extra coupons. My sister’s favorite is Groupon. What is your favorite money-saving app? Remember to think about what is possible and what you can do. The world is a place of abundance and you have options. You can do this. Honestly, what other choice do you have? Supporting your children is a lot like when you gave birth to them. Even if you are utterly exhausted and don’t think you can do it, you started this journey and you will finish it. Everyone needs to eat and you probably also prefer that they sleep inside. The solution is to make your plan and work the plan. Start by believing you can do this. I made a private Facebook group just for you. Join us so we can cheer you on and you can cheer us on. Check out Empowered Single Mom Tribe here.